Drag races may not be clever but they certainly are big. 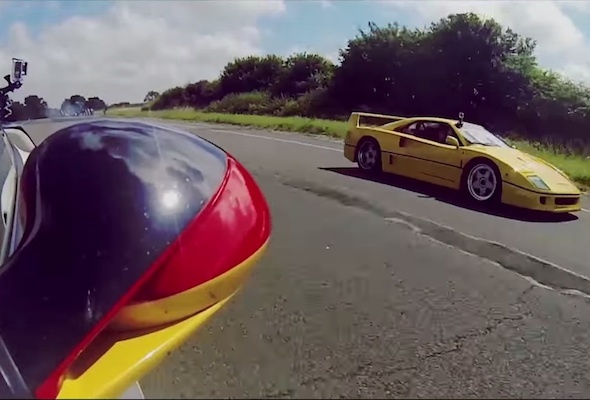 This supercar showdown video has already chalked up nearly 150,000 views. And who can blame viewers as the film is packed with such exotica as a very yellow Ferrari F40 and a McLaren P1 all fighting it out for supremacy on the runway? No video can truly replicate the sense of speed as these machines fire down the Tarmac, but what you do get is the intoxicating sound of dozens of cylinders working at warp speed. Racers include rare machinery such as the Ford GT 720 Mirage, Porsche 911 9FF and McLaren P1. Other competitors vying for victory are the Lamborghini Aventador and the McLaren MP4-12C. With a winner-stays-on strategy, you'll be seeing a lot more of some cars than others.